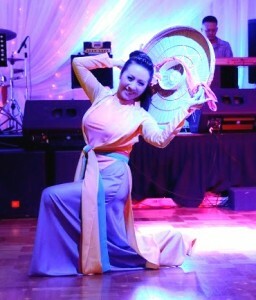 More than 450 guests came to give support to our gala dinner “Tuổi Xanh Nào Cho Em” held on 6 September 2013 at Liberty Palace Restaurant, Bankstown. The dinner was to raise funds for many of our aid projects in remote rural areas in Vietnam, specially the construction of a new building for the Mái Ấm Tình Thương (MATT) orphanage in Lagi, Bình Thuận province. Special guests at the dinner were Sisters Nguyễn Thị Thanh Mai and Nguyễn Thị Thanh Trang from the ‘Lovers of the Holy Cross’ church of Nha Trang Diocese. Sister Mai, the founder and director of the MATT orphanage, gave a moving account of the efforts by the orphanage to relieve the plight of the poor and the disabled in the surrounding areas. The evening proceedings were superbly conducted by the lively, eloquent MC, Dr Lê Vũ. Entertaining was provided by many well-loved musicians and artists in Sydney: Quỳnh Xuân, Thiên Hương, Kim Thúy, Thanh Tâm, Hoàng Phương, Jimmy and the popular music band The Sun Rise, conducted by Dr Thi. Making special appearance at the dinner was the talented and versatile concert pianist Vân-Anh Nguyễn. Prior to and during the dinner many volunteers from various groups such as the Gia Đình Phật Tử (The Buddhist Family), the Mở Rộng Vòng Tay (Open your Arms, Open Your Heart) charity group, etc gave us their helping hands in many tasks such as promoting the event, selling diner tickets, ushering, selling raffles tickets, collecting donations, etc. Through this dinner we raised a total of $22,069, which consisted of $8,083.00 donated exclusively (by requests from the donors) to the MATT project, $3,202.00 to other aid projects and $10,784.00 the proceeds from the sales of dinner tickets, raffles, and DVDs. The Foundation has decided to donate a third of the $10,784 proceeds (i.e $3,594.70) to the MATT project also. Therefore, as support for the MATT project, a total of $11,677.70 was handed over to Sister Mai on 10 Sep 2013. The remaining $10,391.30 of the dinner proceeds will be used for other Foundation’s aid projects. The dinner would not have been a success had we not been given valuable support by many people in many ways: attending the dinner, helping with the organizing or giving donations in cash or in kind. We wish to give to all a heart-felt thank you. The MATT has been in operation for 7 years. It has been carrying out many “pro-life” programs, which include counseling and helping unmarried pregnant mothers to avoid abortion, giving them shelter, bringing up orphans, as well as caring for the poor, the disabled, and the people affected by Agent Orange in the area. Currently the orphanage houses 93 orphans aged between new-born and 8-years old and is run by 10 sisters and 18 assistants. Due to the increasing demand for the services from the locals, the existing facilities become inadequate. The orphanage aims to construct a new, additional building which can accommodate 150 orphans (from 2-days old to grown-up) and has enough space to provide adequate facilities in support of up to 300 disabled persons who come monthly for food and medicines.